When you walk in a c asino, you can often find the craps table by the rowdy crowds around it. And if you happen to come in at a calmer time, look for a green, long table with about four casino workers near it. Now, what do you need to know about this table that’s so important to your game play? First, what material makes up the table and how is it designed? Allowing up to 24 players, it is made of felt printed with designs showing the places of bets. A center area is for One Roll bets and Hardways. The ends of the table have places for the Pass Line, Place, Come, Field, and other wagers. Each table end is the same as the other. The Pass Line covers the outside edge of side betting zones and means the player is betting the dice will pass it. This is a usual wager. On the first throw of the dice, a pass line wager is won if a 7 or 11 come up, but 2, 3, and 12 are losers; any other number than these will be the “point” used for the rest of the game. The Come box is in the upper side sections. A Come bet can’t be done until after a come-line roll, or it will be considered a Pass Line bet. Only after the point is established can a Come bet be wagered. Now, Place bets are the numbers behind the Come Line. These wagers only count after a come-out roll. The come-out roll is the initial throw of dice that decides how the rest of the game will proceed. Finally, the field is the middle of the table and right in front of the come line. A field wager only counts for one throw of the dice. Understanding the craps table may seem hard at first, but with practice, you will know it perfectly. Vegas Craps – A brand new take on the casino classic! 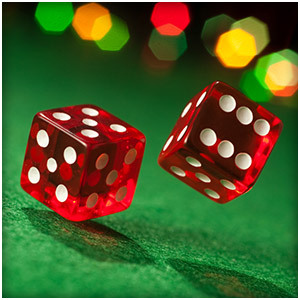 As casino games go, Craps is one of the most instantly recognisable. The sight of the dice-roller at the end of the pit and a crowd of gamblers gathered around the table cheering them on, is one of the most enduring images in a real world casino. Now you can bring all the action of this fast-paced game to life thanks to Microgaming’s brand new offering Vegas Craps. What Microgaming have done is taken their older craps game from their ranges of casinos and given it a radical overhaul to bring it right into the 21st century. The new game is bigger, better and brighter in every sense of the word. The Graphics are clearer, crisper and better than ever before, with the animations so smooth you’ll feel just like you are really there. Add to this a fabulous ambient soundtrack and authentic dice rolling sounds and you’ll feel like you are in the gambling halls of Vegas, rather than sat at your laptop or PC. One of the most appealing things about Craps to gamblers is the wide range of bets on offer and all these bets are brought vividly to life in this new incarnation of the game. Betting is as easy as simply placing the chips of your choice on the bets you want to make on screen, then sitting back and seeing what the next dice roll brings. Bets start from as little as 1 credit and there are several enticements to keep you at the table, The Field bet pays double when the dice score a 2, and triple when a double six is landed. Buy and Lay bets also pay at true odds, with only a 5% commission on winnings. With a jackpot available of 3,100, fast and furious action and superb graphics and sound effects, why not have a roll of the dice at your Microgaming casino of choice? Craps is reputed to be an exciting game – the crowd, the chips, the lucky rolls – the buzz never ends! While the reality is not always like that, Craps is still one of the best casino games. Let’s recount some of the reasons that make this dice game so fantastic. The Craps table can look intimidating with its elaborate betting fields, but this is really an illusion. Once you learn the basic rules of wagering in Craps, you will be surprised how simple the game is. It all boils down to navigating your bets through the succession of “come-out” and “point” rolls! The betting system in casino Craps often places gamblers on one side and the house on the other. If there’s a shooter with a lucky streak, everyone is free to join in, betting on Pass and cheering him on. In this atmosphere, the players briefly bond and share the excitement over the game, making for a more memorable and fun experience. Of course, you can also choose to bet on Don’t Pass, but beware, this will not make you very popular among fellow players. Most importantly: in Craps, there are some bets for which there is no house edge. This specifically refers to taking odds on your Pass Line bet. Read more about the Free Odds bet, since it will give you the best chances to win big! Even disregarding the Free Odds bet, the house edge on standard Pass Line bet is only 1.41% – which is low for a casino game. Given all this, it’s no wonder Craps is one of the best casino games! Should I use the Hard Way Bet?